One of the sad things you learn when you start to cook is that you can’t just put all your favourite ingredients on a plate and expect them to work. It would be nice, but it rarely happens. So I was really pleased to come across this idea for ‘avocadonnaise’, essentially avocado whizzed together with lemon juice and dill. Well, that’s two of my favourite foods of all time in one sauce. It’s also asparagus season, so I thought, Why not? Why not indeed? The dill and avocado work well together. 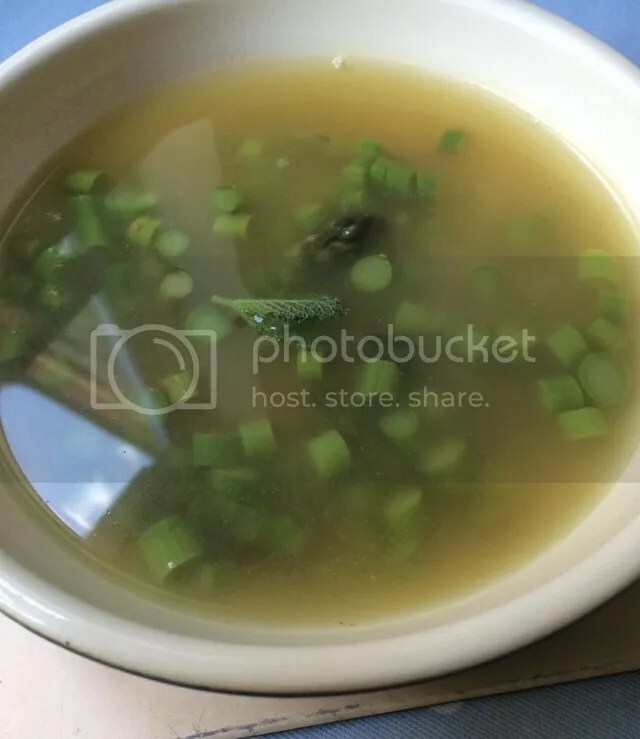 The sauce can be made while the asparagus cooks. The whole makes a great starter where the taste far exceeds the amount of effort that goes into producing it. When it is hot enough, coat the asparagus spears in a little oil and place on the griddle. Turn the heat down a couple of notches. While the asparagus is cooking, stone and peel the avocado and put the flesh in a bowl. Add the lemon juice and dill and mash together with a fork until you have a smooth paste. Turn the asparagus spears over to get the griddle marks on all sides. 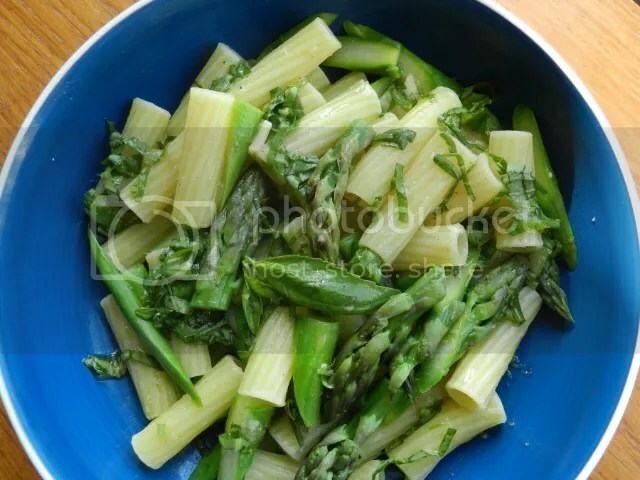 Test the asparagus for ‘doneness’ with the point of a sharp knife in the thickest part of the stem. When tender remove from the griddle and serve with the avocado sauce. It’s nearly the end of the British asparagus season. I was pleasantly surprised to find that my local deli was still selling it on Saturday. This is probably the last recipe I’ll make with it this year, but it’s a good one. Soaking the onions in vinegar is a tip I got from Nigella Lawson. It softens the taste of the onions and turns them bright pink at the same time – win/win! Although this is a warm salad, it’s just as good cold. Put the lentils and vegetable stock in a pan and bring to the boil. Simmer for 30 minutes or until the lentils are tender. While the lentils are cooking toss the onion slices in the vinegar and leave to steep. Once the lentils are cooked add the asparagus to the pan and stir so that they are covered. Simmer for 3-5 minutes. Drain the vinegar for the onions and whisk in the olive oil and the mint. 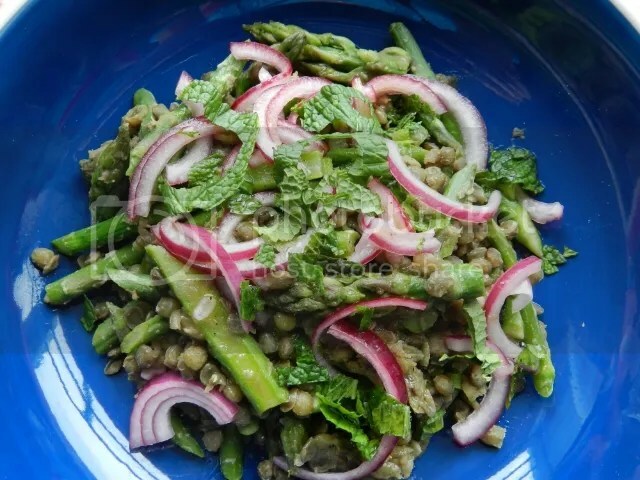 Pour the dressing over the lentils and asparagus. 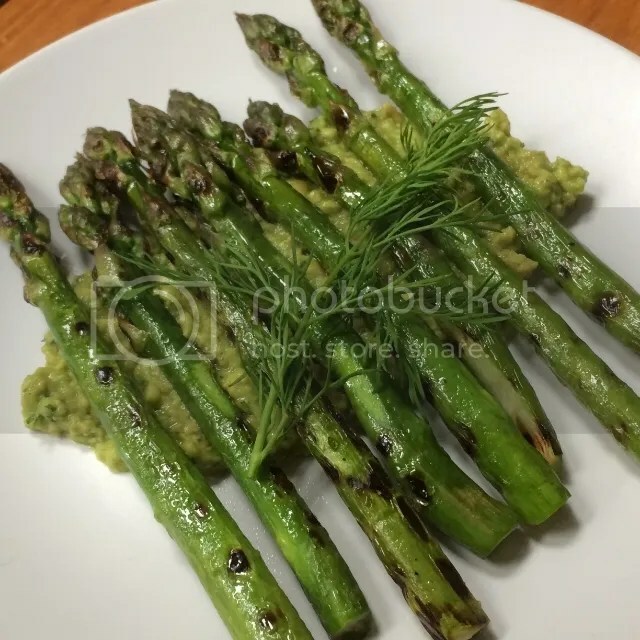 I feel a little guilty about griddling asparagus, as it seems harsh treatment for such a noble vegetable. Griddling, however, does perk up a bunch that’s been hanging around in the fridge for a bit. If you have a griddle pan, coat the asparagus spears in oil and griddle on a medium to high heat. If you are using a frying pan, heat the oil in the pan before adding the spears. Heat them for about 4 minutes each side. Add the olives, mustard, vinegar and olive oil to a bowl and mix thoroughly. 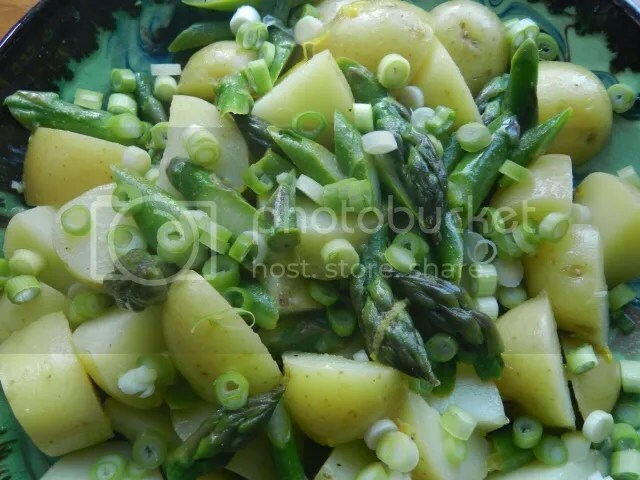 When the asparagus is cooked, place on a plate, scatter with the chopped egg and spoon the dressing over. Serves 2 as a starter or a light lunch with crusty bread to mop up the dressing. 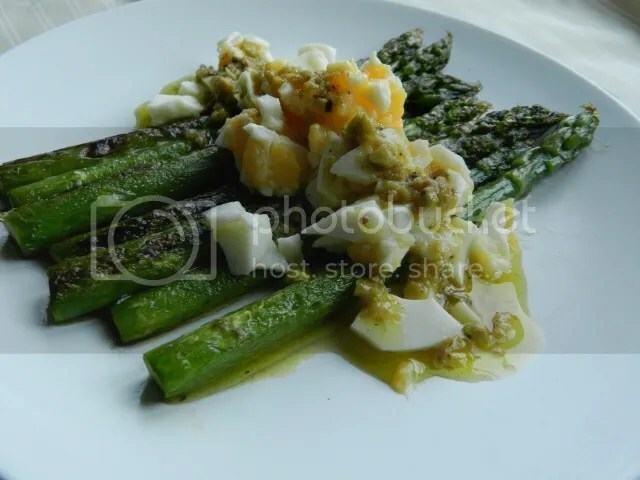 If you want to make a vegan version, the dressing does very well without the egg.